Although neither one of our children has come to appreciate raw or cooked carrots (no matter how I make them) these roasted carrots are a favorite of Dave and mine… and basically my entire extended family (they are a staple at any holiday gathering). 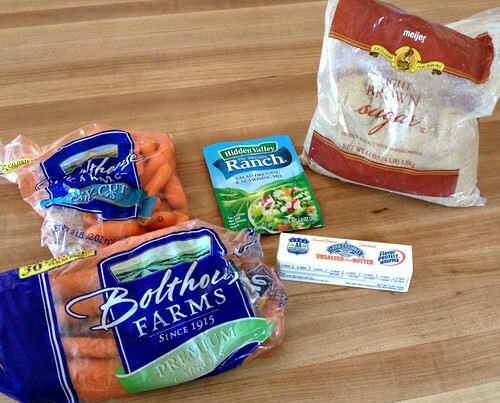 These carrots are SOOOOOOO simple to make, require almost zero hands-on time, and they can even be made in the microwave if you’re short on time! Oh yeah, and they taste amazing! 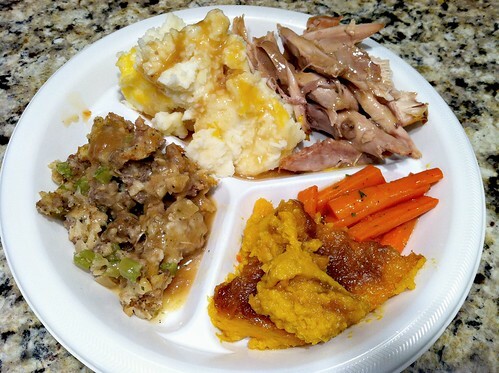 I’ve served these carrots as a side dish to almost any any meat — salmon, pork, ham, roast beef, chicken, turkey, Tilapia, and even my famous ham and cheese baked sandwiches! 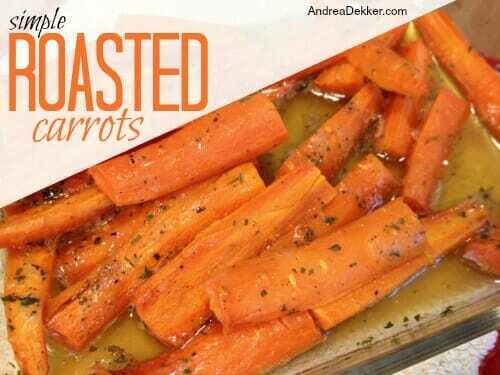 Of course, I can’t speak for everyone, but I dare to bet that even if you THINK you don’t like cooked or roasted carrots, you WILL like these. There is just something about them that seems to please most taste buds and works with almost any main dish. NOTE: the cooking length will vary greatly depending on how large your carrots are. If you are leaving them whole or quite large, you’ll probably need 60-80 minutes. On the other hand, if you cut them into bite-size rounds, you might only need 35-40 minutes. 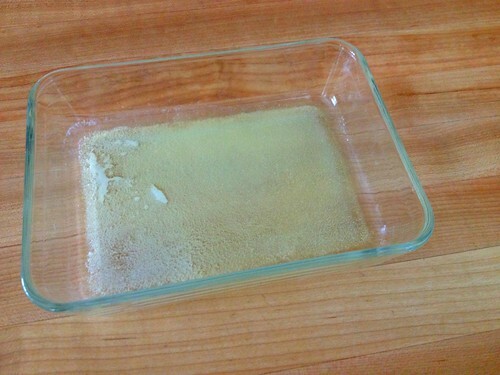 As I mentioned above, you can easily do the same thing in a microwave dish using the same ingredients, just a slightly different cooking method. 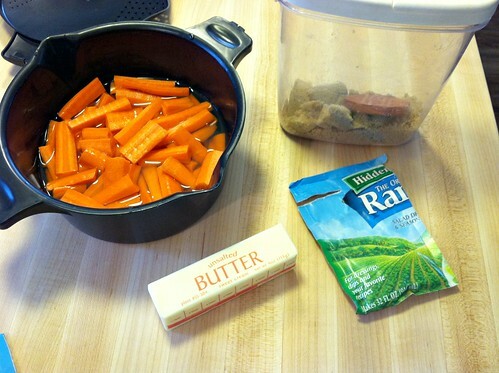 I use my Pampered Chef microwavable pan to do the carrots and it works amazingly well. So there you have it — with about 5 minutes of hands-on time (less if you’re using baby carrots) you have a delicious side dish for almost any time of year, any occasion, and any meal. 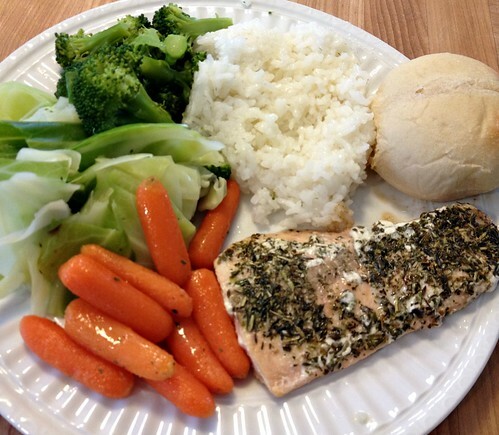 What is your favorite way to serve carrots? 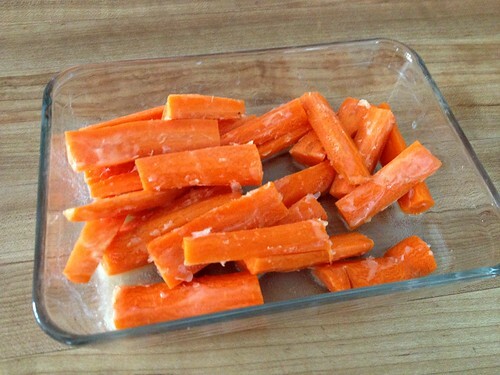 Try this for roasted carrots.Peel and cut carrots into uniform pieces. 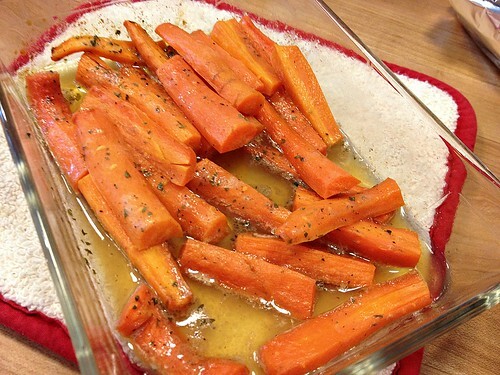 Put carrots in plastic sack and drizzle with olive oil. 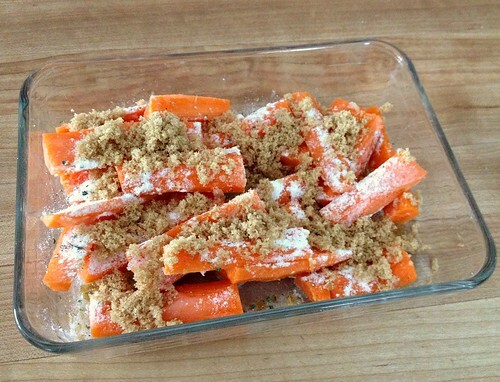 Spread carrots on cookie sheet and sprinkle generously with chilli powder and Kosher salt. Bake 2o minutes in 4oo degree oven ,turn and cook about twenty more minutes until tender. Andrea, thank you so much for simple, delicious recipes ( we especially need more veggies on our table!). You definitely help take some of the stress off cooking for my family. Thanks so much. As an FYI, you can always subscribe via email to still get the posts without visiting my site directly. And you can also change your flash settings within your internet browser to disable anything with “flash” or “java” unless you manually click on it. This is how I have my computer set and it’s much faster because of it. I’m such a dummy! Forgot to include this. 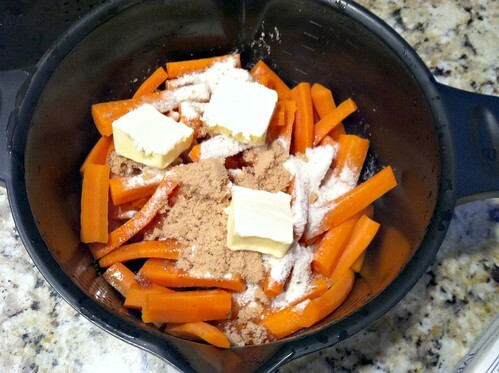 For instant cooked carrots use a pressure cooker for 4 minutes. No need to heat up house with oven. You can add the seasonings and butter after. Baby carrots are really whole carrot peeler cores. They seem to resist cooking. The reason there is no peel is they are made from whole carrots and mechanically created. Who knew? 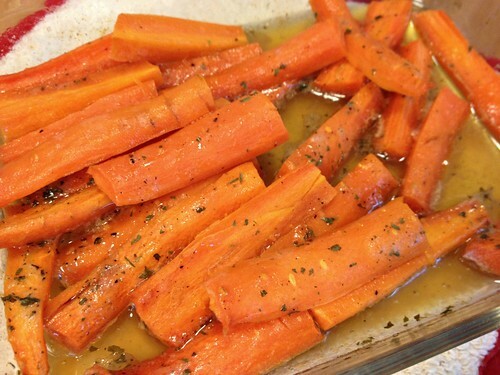 I love carrots cooked with butter and brown sugar. I had a Polish housemate who gave me her family recipe. It’s done on the stove top, and includes an onion. Yummy. As an aside I strongly advise against consuming MSG and farmed fish during pregnancy. If you want really amazing ranch dressing without making it from scratch in order to avoid MSG, try Penzeys Buttermilk ranch. As for tilapia you are eating fish from China contaminated with pesticides, metals and feces. Again as I have oft stated don’t take my word on it, do some research. Even 20 years ago we warned pregnant and nursing moms to avoid fish unless it’s wild caught. The FDA does not require disclosure of ingredients in farm raised fish foods. And no ingredients are disclosed in Asian imports. And even if they did label them, which they don’t the information may be misleading. My husband has been to China many times. There are no environmental controls on what is dumped into the rivers there. As for carrots! It’s really fun to grow them. The kiddos may eat them if they grow them themselves. Ditto for beets! These sound good. I want to try them. Do you use a whole packet of ranch mix? I add a whole garlic (without peeling or cutting) and it ads tons of flavours!!! And then you can use the roasted garlic for a sauce or for mashed potatoes.